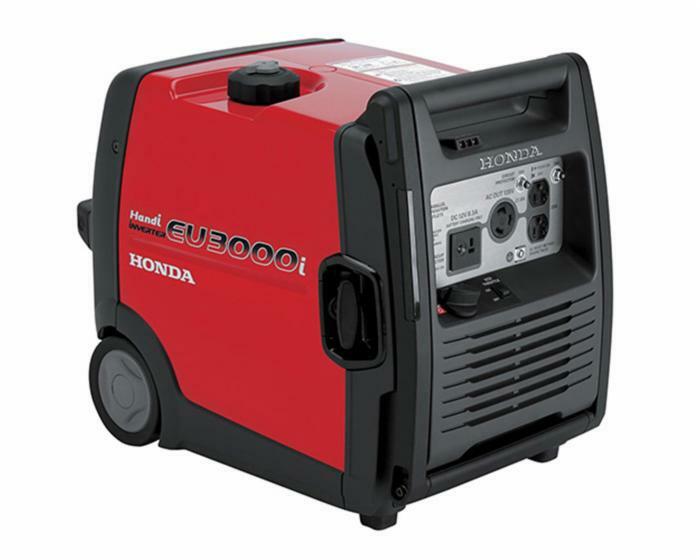 Honda Generator EU3000i Handi is the lightest, most portable 3,000-watt inverter generator ever created by Honda. Equipped with convenient transport wheels and folding handle, this generator is designed for easy packing and transport. The EU3000i Handi also runs up to 7.7 hours on a single tank of fuel, making it a great energy source for camping, tailgating, outdoor work, and home use. Plus, a 3-year warranty ensures that all of these features will work for years to come, covering your generator through countless power outages and outdoor events. * Honda’s lightest 3000-watt generator – only 78 lbs. * Great for powering RV air conditioner units, refrigerators, microwaves, hair dryers, small AC units, portable fans, TV/DVD players, etc.